Statistical reasoning, statistical thinking and statistical literacy are important topics for statistical educators. This page lists resources related to statistical reasoning (S/R). Joan Garfield, pictured above, is a leader in this area. "Over the past decade there has been an increasingly strong call for statistics education to focus more on statistical literacy, reasoning, and thinking. One of the main arguments presented is that traditional approaches to teaching statistics focus on skills, procedures, and computations, which do not lead students to reason or think statistically. The SRTL Forums began in 1999 to foster current and innovative research studies that examine the nature and development of statistical literacy, reasoning, and thinking, and to explore the challenge posed to educators at all levels –– to develop these desired learning goals for students. 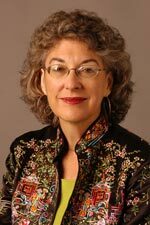 The SRTL Forums, co-chaired by Joan Garfield and Dani Ben-Zvi, offer scientific gatherings every two years and related publications in journals, CD-ROMs and books." "Research in statistics education is an emerging field, with much of the work being published in diverse journals across many disciplines. Locating and synthesizing this research is often a challenging task, as is connecting the research literature to practical issues of teaching and assessing students. 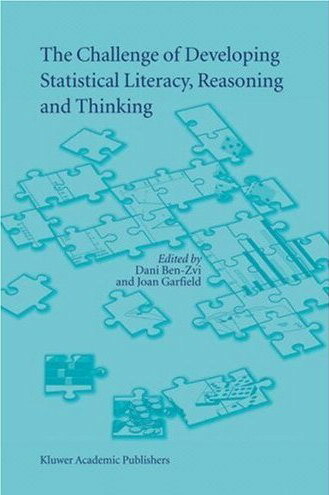 This book is unique in that it collects, presents, and synthesizes cutting edge research on different aspects of statistical reasoning and applies this research to the teaching of statistics to students at all educational levels. Unlike other books on how to teach statistics, or educational materials to help students learn statistics, this book presents the research foundation on which teaching should be based. The chapters in this volume are written by the today's leading researchers in statistics education. This volume will prove of great value to mathematics and statistics education researchers, statistics educators, statisticians, cognitive psychologists, mathematics teachers, mathematics and statistics curriculum developers, and quantitative literacy experts in education and government." Back cover. Order from Amazon. Statistical literacy includes basic and important skills that may be used in understanding statistical information or research results. These skills include being able to organize data, construct and display tables, and work with different representations of data. Statistical literacy also includes an understanding of the concepts, vocabulary and symbols and includes an understanding of probability as a measure of uncertainty. Statistical reasoning may be defined as the way people reason with statistical ideas and make sense of statistical information. This involves making interpretations based on sets of data, representations of data, or statistical summaries of data. Statistical reasoning may involve connecting one concept to another (e.g., center and spread), or it may combine ideas about data and chance. Reasoning means understanding and being able to explain statistical processes and being able to fully interpret statistical results. Statistical thinking involves an understanding of why and how statistical investigations are conducted and the "big ideas" that underlie statistical investigation. These ideas include the omnipresent nature of variation and when and how to use appropriate methods of data analysis such as numerical summaries and visual displays of data. Statistical thinking involves an understanding of the nature of sampling, how we make inferences from samples to populations, and why designed experiments are needed in order to establish causation. It includes an understanding of how models are used to simulate random phenomena, how data are produced to estimate probabilities, and how, when and why existing inferential tools can be used to aid an investigative process. Statistical thinking also includes being abele to understand and utilize the context of a problem in forming investigations and drawing conclusions and recognizing and understanding the entire process (from question posing to data collection to choosing analyses to testing assumptions, etc.). Finally, statistical thinkers are able to critique and evaluate results of a problem solved or a statistical study. Ben Zvi and Garfield (p. 11): "Gal proposes ... a conceptualization of statistical literacy and its main components. Statistical literacy is described as a key ability expected of citizens in information-laden societies, an expected outcome of schooling, and a necessary component of adults' numeracy literacy. Statistical literacy is portrayed as the ability to interpret, critically evaluate and communicate about statistical information and messages. Gal suggests that statistically literate behavior is predicated on the joint activation of both a knowledge component (comprised of five cognitive elements: literacy skills, statistical knowledge, mathematical knowledge, context knowledge and critical questions) and a dispositional component (comprised of two elements: critical stance, and beliefs and attitudes)." Pfannkuch and Wild (p. 27): "Causal Inference:" Fisher's "insistence on raising other possible causes for lung cancer -- together with Cornfield, Doll and Hill's careful logical analyses of the data -- markedly increased awareness of the importance of statistical thinking in medicine. Alternative explanations of rhe association between lung cancer and smoking suggested by Fisher and others were systematically refuted by Cornfield, Doll and Hill until there could be no other plausible interpretation of the data. The debate on the association between smoking and lung cancer, which began in 1928, culminated in the 1964 publication of the US Surgeon General's report, a landmark in the setting of standards of evidence of inference of a causal relationship from observational studies." Thus, in epidemiology, it was recognized that purely statistical methods applied to observational data cannot prove a causal relationship. Causal significance was therefore based on "expert" judgment utilizing a number of causal criteria such as consistency of association in study after study, strength of association, temporal pattern and coherence of the causal hypothesis with a large body of evidence. It should be noted that whether the study is experimental or observational, the researcher always has the obligation to seek out and evaluate alternative explanations and possible biases before drawing causal inference." Gal (p. 40): "This paper develops a conception of statistical literacy that pertains to what is expected of adults (as opposed to students actively learning statistics), particularly those living in industrialized societies. 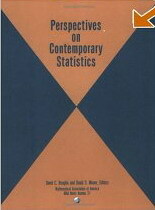 It is proposed here that in this context, the term statistical literacy refers broadly to two interrelated concepts, primarily (a) people's ability to interpret and critically evaluate statistical information, data-related arguments, or stochastic phenomena, which they may encounter in diverse contexts, and when relevant (b) their ability to discuss or communicate their reactions to such statistical information, such as their understanding of the meaning of the information, their opinions about the implications of this information, or their concerns regarding the acceptability of given conclusions." "Innovations in Teaching Statistics is a book about teaching statistics. These stories are told by fourteen different instructors of innovative statistics courses, who demonstrate that learning statistics can be a positive, meaningful, and even exciting experience. Despite the prevailing opinion that statistics courses are dull and difficult for students, these stories pain quite a different picture. In the classes of the instructors whose stories fill this book, students are engaged in learning, are empowered to do statistics, and appreciate the instructional methods of their teachers. The instructors profiles in this book are inspiring, dedicated teachers who have devoted considerable effort to creating courses and materials that enable students to successfully learn statistics. Each chapter begins by describing how the author became a teacher of statistics, then provides details about the courses they currently teach, describing their teaching method, textbook, types of student assessments, and uses of technology. One typical class is described in detail, to provide a snapshot of what each person's teaching looks like. The writers then tell the story of the process they went through in developing an innovative course, and conclude their chapters with a discussion of their future plans for course revision or development. As you read these stories, you will learn about some great activities, some helpful technological tools and some innovative assessment methods." Back cover. Order from Amazon or search/order at the MAA Bookstore. Moreno (p. 24): "Overall, I want my students to leave my course with a conceptual understanding of what statistics does and why it is needed, and how statistics does what it does. Fundamental ideas that they should appreciate as citizens are: the reason for statistics; the understanding of graphs, the purpose of basic summary statistics, the design of an experiment, observational study, survey, poll; that statistics does not prove anything; uncertainty and the concept of probability (including risk analysis); misleading conclusions implied from newspaper articles headlines; and the question of statistical hypothesis testing." Moreno (p. 30): "We are not large enough to afford to offer both a statistical literacy course (that focuses on concepts) and a statistical methods, I have to find a way to blend concepts and methods into one course." "No matter how the course is presented, it must be meaningful in order for a student to become a statistically literate citizen, it must be useful for a student's major; it must be interesting and fun as a classroom experience." Lock (p. 36): "students to find an article in a journal, magazine, book or newspaper that uses statistical reasoning in some way and write a critique of about how statistical issues are handled in that article. As part of the write up, I ask students to include a couple of statistically-related questions that they would want to ask the author(s) of the article." Peterson (p. 40-41): "Chance is a course about how to read a newspaper. More specifically, it aims to make students more informed consumers of news stories that involve statistical reasoning. The course therefore focuses on reading and responding to real-world applications of probability and statistics as they are reported in the news media." "The Chance course is designed to help students read, interpret, and critically evaluate statistical information from these sources." "All versions of the Chance course share similar goals. First, we hope that students will develop an appreciation for the importance of random phenomena in the world around them, and learn to use statistical reasoning in everyday life. Second, we want our graduates to be critical readers of news stories that involve probability and able with expressing statistical insights in oral and written English." "I have found that several broad themes always seem to run through my courses. The first is that numbers never "speak for themselves." "A second major theme is to understand the implication of variation and being able to reason in the face of uncertainty." "Third is the repeated warning that correlation is not causation." "Statistics provides a wonderful framework for understanding why causality is so hard to establish. The pitfalls of lurking variables and the virtues of good experimental design are important lessons for all students to internalize." "A fourth theme involves learning how to read a graph, and how to recognize graphical abuses in the popular press." "My last theme .... is that chance is lumpy." Peterson (p. 46): "Recent years have seen increasing calls for required courses in quantitative literacy." "On the whole, I agree with those writers who have argued that quantitative literacy is not identical with statistical literacy. Nevertheless, as Cobb's (1997) essay shows, statisticians have an enormously important role to play at these discussions. The practice of statistics is, by its very nature, interdisciplinary, and the lessons we have learned as statisticians can provide important models for quantitative literacy." delMas (p. 53): "The overarching goal of the course is to have students develop problem solving and decision making skills through the collection, analysis, and interpretation of data. Students are expected to learn how to analyze and interpret quantitative information, to use statistical thinking, to develop statistical reasoning, and to communicate using the language of statistics. Students are also expected to develop a level of statistical literacy that enables them to critically assess information encountered in the media and other sources." 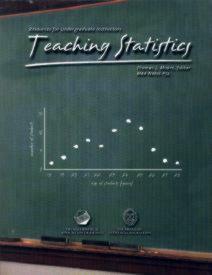 "The title of the lead article in this volume, Teaching Statistics: More Data, Less Lecturing, summarizes succinctly the basic tenets of statistics educational reform of the past 10 to 15 years, tenets around which the statistics profession has formed a surprisingly strong and supportive consensus. This volume strives to be an instructor's manual for this reform movement and will be essential reading for anyone at the undergraduate or secondary level who teaches statistics, especially for those new to the teaching of statistics. Behind this reform is the notion that statistics instruction should resemble statistical practice. Data lies at the heart of statistical practice and should thus form the center of instruction. Since most statistical practice involves issues of the collection, analysis, and interpretation of data, students should learn about and experience all three of these aspects continually in their learning. Teaching Statistics: Resources for Undergraduate Instructors presents a collection of classic and original articles on various aspects of statistical education along with descriptions of innovative an successful projects. The volume provides complete descriptions of projects along with companion pieces written by teachers who have used the projects and can provide practical advice to readers on how to use projects effectively. Other sections include motivation for and advice on how to use real data in teaching, how to choose a textbook at the introductory or mathematical statistical level, how to make effective use of technology, and how to better assess students by going beyond the reliance on in-class examinations. Cobb (p. 3): "We offer two recommendations: A. More Data and Concepts, B. Emphasize Statistical Thinking. An introductory course should take as its main goal helping students to learn the basic elements of statistical thinking. Many advanced courses would be improved by a more explicit emphasis on those same basic elements, namely: 1) The need for data, 2) The importance of data production, 3) The omnipresence of variability, 4) The quantification and explanation of variability, 5) Effective learning requires feedback. " Cobb (p. 4): "How Students Learn: What Research Tells Us. Shorn of all subtlety and led out of the protective fold of the education research literature, there comes a sheepish little fact: lectures don't work nearly as well as many of us would like to think. This rather discouraging assertion follows from two clusters or research results -- the first shows what makes learning hard and lecturing often ineffective, the second shows what does seem to work when lecturing doesn't. 1) Basic concepts are hard and misconceptions persistent. 2) Learning is constructive. 3) Foster active learning. As a rule, teachers of statistics should rely much less on lecturing, much more on the following alternatives: i. Projects either group or individual. ii. Lab exercises. iii. Group problem solving and discussion. iv. Written and oral presentations. v. Demonstrations based on class-generated data. A Time-Subject Index for Against All Odds: Inside Statistics, by Edward R. Mansfield. David C. Hoaglin and David S. Moore, Editors. "This book is a must for anyone who teaches statistics, particularly those who teach beginning statistics -- mathematicians, social scientists, engineers -- as well as graduate students and others new to the field. The authors focus on topics central to the teaching of statistics for beginners, and offer expositions that are guided by the current state of statistical research and practice. Statistical practice has changed racially during the past generation under the impact of cheaper and more accessible computing power. Beginning instruction has lagged behind the evolution of the field. Software now enables students to shortcut unpleasant calculations, but this is only the most obvious consequence of changing statistical practice, the content and emphases of statistics instruction still needs much rethinking. This volume assembles nine new essays on important topics in present-day statistics that will influence the teaching of statistics at the college level and elsewhere. Students approach statistics with various levels of mathematics preparation , and from diverse disciplinary backgrounds. Accordingly the chapter present modern perspectives on central aspects of statistics and emphasize the conceptual content that should accompany all varieties of beginning instruction. This book opens with a contemporary overview of statistics as the science of data -- a view much broader than "inference from data" emphasized by much traditional teaching. The next two chapters discuss the philosophy and some of the tools used in data analysis and describe the impact of computing on data analysis and inference and its implications for teaching. Other chapters examine the science of survey sampling, essential concepts of statistical design of experimentation, contemporary ideas of probability and the reasoning of formal inference. The book concludes with introductions to diagnostics and to the alternative approach embodied in resistant and robust procedures. Moore (p. 3): "Statistics is the science of gaining information from data. Data are of course numbers, but they are more than that. Data are numbers with context." "The questions [involving statistics in the daily news] are strikingly different from the issues we most often address in teaching statistics. A mathematics student who takes a typical course on probability and statistics is ill-prepared to answer such questions. Students in traditional statistical methods courses are only a bit better off. A wide gap separates statistical teaching from statistical practice." Shafer (p. 93): This paper "reviews Kolmogorov's axiomatization and the three standard interpretations of this axiomatization: the belief interpretation, the frequency interpretation, and the support interpretation. Each interpretation, as we shall see, has its appeal and its difficulties." "Probability is a complex idea, one that draws together ideas about fair price, rational belief and knowledge of the long run." Chapter 1: What is Statistics? (David S. Moore). 1.1 The Science of Data. 1.2 Data Analysis. 1.3 Producing Data. 1.4 Inference 1.5 The Role of Statistical Theory. 1.6 Conclusion. Chapter 2: Data Analysis (Paul F. Velleman and David C. Hoaglin). 2.1 What is Data Analysis? 2.2 The Development of a Data Analysis Philosophy. 2.3 Some Contributions of Design. 2.4 An Example: Salaries of Major League Baseball Players. 2.5 Principles of EDA. 2.6 Functional Models. 2.7 Philosophical Differences. 2.8 The Role of Computing. 2.9 Going beyond the Data at Hand. 2.10 Conclusion. Chapter 3: Computers and Modern Statistics (Ronald A. Thisted and Paul F. Velleman). 3.1 The Science of Statistics. 3.2 Teaching. 3.3 Computing and Data Analysis. 3.4 Obstacles. Chapter 6: What is Probability? (Glen Shafer). 6.1 Introduction. 6.2 Three Interpretations of Kolmogorov's Axioms. 6.3 Three Interpretations in Practice. 6.4 Three Aspects of Probability. 6.5 Lessons for Teaching. Chapter 7: The Reasoning of Statistical inference (Lincoln E. Moses). 7.1 Introduction. 7.2 Some Examples. 7.3 Some Types of Statistical Inference. 7.4 Which Model? Which Analysis? 7.5 Theoretical Statistics. 7.6 Remarks about Teaching Statistical inference. Chapter 8: Diagnostics (David C. Hoaglin). 8.1 Diagnosis. 8.2 Leverage and Influence in Simple Regression. 8.3 Leverage and Influence in Multiple Regression. 8.4 Departures from Assumptions. 8.5 Robust/Resistant Alternatives. 8.6 Cooperative Diversity. 8.7 Conclusion. Chapter 9. Resistant and Robust Procedures (Thomas P. Hettmansperger and Simon J. Sheather). 9.1 Introduction. 9.2 Basic Likelihood Theory for the Location-Scale Model. 9.3 Basic Likelihood Theory. 9.4 Robust and Resistant Methods. 9.5 Resistance Properties of Estimates. 9.6 The Simple Regression Model. 9.7 Diagnostics. 9.8 Bounded-Influence Regression Estimates. 9.9 Extensions and Further Developments.